If you have read the book why not send us a review? Here's some useful advice from fellow travelers! Here are some of the reviews we have received. If you have read the book why not send us a review? We welcome reviews from all readers. It doesn't matter whether they are positive or negative; if they are entertaining enough we will publish them here! '"BOUNDLESS" is a riveting story told with panache, bravery and honesty. Although alluring, the often inhospitable landscape of the emerging Soviet Union, with its vodka and Big Business, brings with it a relentless build up of personal stress and threatened self-destruction. The energy and pace of the prose compels us forward as we live through the inner and outer world of Greg. We're often rewarded with poignant glimpses of the beauty of the natural world in contrast to the inner tensions and outer chaos. How blissful too, as we discover that the peace Greg experienced in an avalanche, a near death experience, can be lived on a daily basis. The joy of his discovery is shared brilliantly. 'In reading Boundless I was carried along on a rollercoaster of ever increasing anxiety about where Greg was heading and, if he ever got there, what other calamity was about to emerge in his fast disintegrating life. Putting the book down , once started , was not unlike what one was reading - near impossible. But the impossible, in the end, lead to an amazing life choice, via twists and turns and a dash of good luck. 'I found this book covered a lot of different topics of interest for me. I enjoyed the story of Russia after the fall of the Berlin Wall and I found the Author's exploration and journey to find Peace was inspiring too. He is a very honest writer sharing so much of himself that you feel very connected to him and his journey. And there is plenty of 'eye-opening' action, if you ever wondered what was like doing business during the post perestroika / glasnost era in Russia read the book. I know it's an overused phrase but once I’d started reading I couldn’t put it down. Most of all, the appeal and resonance of the book to me is that it is a frank, absolutely no nonsense, easy to read travelogue of an internal journey about finding peace. In the end it is not so much about the events or locations along the way but the story of the frustration of knowing there must be more and the determination to find the answer. This book will appeal to a diverse range of readers. The chapters on life in Russia are a rollicking word-picture of a world which has gone. The later chapters describe the author’s quest for mental peace, but with the added objective of starting the reader on their own journey. I was engrossed in the writing, which is down-to-earth, and no-holds-barred. The word pictures of the outside world are vivid and clear. So are the pictures of Hopkinson’s inner world. Boundless the book is part of a larger project. The web site continues the story, and will take the searching reader on further self-explorations. For these readers the book is the beginning, not the end. Even if you don’t buy into the search for inner peace and happiness, the book is worth reading for the stories, and to meet an interesting guy. Write your own review of BOUNDLESS! Make it entertaining and we will publish! Feel free to attach a photo if you wish. Please try and keep it to 500 words or less! Choose your destination by clicking on the Departure Board. A Long, Strange Trip, but he got to "Here and Now"! 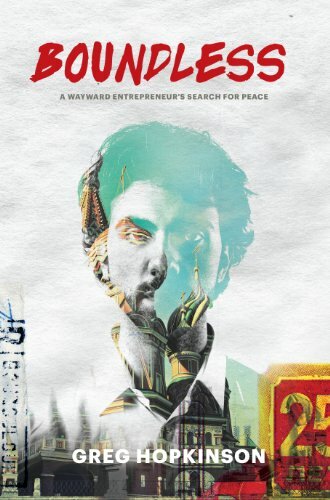 'Although fast living through high-stakes business deals, travel to exotic places, drugs (prescription and otherwise) and social drinking is not my experience, I could relate to Greg's ongoing sense that peace and happiness was just around the corner, just if . . . but not just yet. I appreciate his transparency in relating his feelings about how a spiritual path and the pull to follow it played out against the judgmental thoughts in his head. This is an inspiring account of how inner peace IS available for all - even a fast-living dude who looked for it in all the "wrong" places. I also love how he gave some perspectives of the spiritual path he was following through the teachings on appreciation, gratitude, love and compassion as well as what it is like to be a modern-day monk! Not what you would think! Spoiler alert: he gets the girl he really wants in the end. In addition, the experiences he related in Russia give a little inkling about what might be behind some of the goings-on in Russia today. 'You have to be captivated by a book that begins when much to his own surprise, the hero, completely trapped under the snow during an avalanche, experiences absolute peace instead of the hysteria most of us would expect. From its dramatic beginning to its inspiring conclusion, Boundless is a great story told by a high-spirited bloke you can't help but love. Greg Hopkinson, a victim of his own appetites, goes to the Soviet Union during it's final days to make the big score. He takes us to business meetings where skill and talent mean less than the ability to consume large quantities of alcohol; where even the most brilliant women regularly sell themselves to strangers; where men die in the middle of a deal. But he remains haunted by memories of the peace he experienced when he was so close to death. In the final chapters of the book, Greg discovers a spiritual path that when embraced, allows him to move into that state of peace perpetually.